Summary from Goodreads: As the nation burns, Marcus Diablo vows that those responsible will pay. Annie Diablo goes missing while backpacking in the Eastern Sierras with her husband Marcus, and their two young sons. Marcus becomes the FBI's chief suspect. His claims that Annie was abducted by a group of homegrown fanatics planning to set fire to the forests in Yosemite National Park and the surrounding wilderness areas, are dismissed as the desperate lies of a guilty man. But when, from California to Connecticut, the nations forests erupt in flames it becomes clear that Marcus was innocent. As an attack, no one was prepared for, strikes fear and panic into the hearts of every American and society unravels, Marcus, following the smallest clue, finds the man who abducted Annie, and uncovers an organization that for thirty years remained hidden, embedded deep in American Society. Following an insane hunch, Marcus embarks on a quest that takes him from his home and family, to Australia's inhospitable Outback, to the tribal lands of the Hindu Kush, to the arid expanse of the Syrian Desert, to the freezing waters of the Bering Sea. Marcus will form unlikely alliances, cheat death, receive gifts of priceless value and along way, change his life and the lives of all he touches, forever. Review: A thrilling ride that will leave you breathless. I dove right into this book, reading it quickly from cover to cover. It was fast paced and full of action. Although the story kept me entertained throughout the book, I felt that parts of it were flimsy and unrealistic. Like the part where the son was having dreams about talking to his mom, and then his mom was having dreams about the same conversation. I would expect that more in a paranormal, not a thriller. The points of view switched around a lot, and sometimes we connected with the bad guys of the story. I think it would have made the story more intriguing if the bad guys didn't tell you what they were about to do. All together, this book had lots of potential. I just wish there was more connection with the characters and their surroundings. 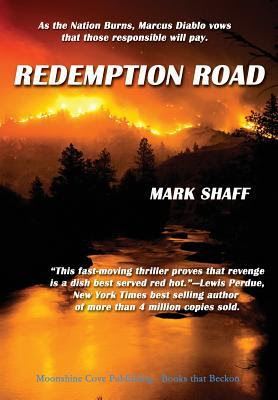 Three stars for Redemption road. Summary from Goodreads: In the debut Marcus Diablo novel, Redemption Road, Marcus' wife, Annie, is murdered during a terrorist attack on the United States. 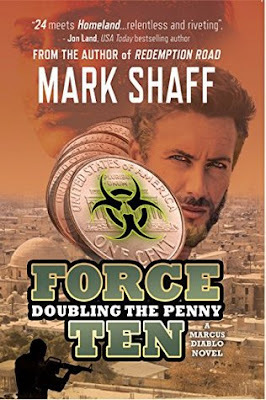 Now in the highly-anticipated sequel, Marcus Diablo and Force Ten are back. As Marcus struggles to raise his sons and heal their broken hearts, he must reconcile his feelings for the woman who has fallen in love with him and his boys. When an attack on the nation's Internet system brings all communications, transportation and financial networks to a halt, Marcus is forced to define his role as a full-fledged member of Force Ten-the world's most respected and effective private military contracting firm. Join Marcus Diablo and an unforgettable cast of characters as they come to terms with the power of family and love, while they fight to save a nation and bring their brand of Justice-Force Ten Justice-to those responsible. Review: This book jumped right into the action. We follow Marcus Diablo in the aftermath of a terrorist attack and the murder of his wife. There was a lot of action in this story. I wasn't really invested in the characters like I would want to be. 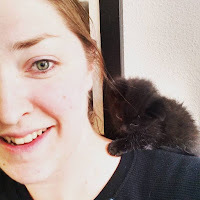 World building is key, and I didn't get a lot of that. The story was intriguing and kept me interested throughout the book.